I talk to lots of companies about who they hire and how they train. Because, let’s face it, any company with more than one employee relies on the entire staff to deliver on the promise of the brand, or at least the promise made in the marketing brochure. Companies that get this work to hire and train for fit and service, strive to empower their people to make decisions in the field and to think like entrepreneurs. 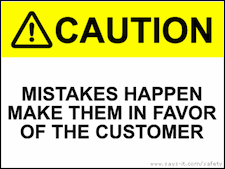 Companies the really get this know that mistakes will be made and only ask that when they make a mistake or are faced with a tough customer related decision, make it in favor of the customer. This mindset doesn’t ask you to encourage mistakes, but it may be the ticket to actually empowering your staff. Everyone talks about empowerment, but this may be the dead simple filter for how to really install it. If you let your people know that it’s okay to make mistakes as long as they favor the customer, you may equip them with the tools they need to make decisions that always reflect positively on the brand. With this mindset, you may indeed eat a few projects gone bad, but the potential good buzz created by making a decision that has a positive outcome for the customer, will pay dividends far beyond the decision to jump in and spend money to fix something gone awry. Your staff must learn from mistakes, but if as an organization this is the culture, mistakes, and your ability to overcome them in stunning fashion, can define the brand in a way that generates a reputation for remarkable service, loyal customers and, perhaps most importantly, confident and supported employees.